Manly Council is proud of its environment - and with good reason. 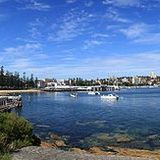 Located on the southern end of the Manly-Warringah peninsula, Manly Council boasts "a rich and diverse character with its natural and developed environment, along with its array of land uses, contributing to making Manly an attractive destination for residents and visitors alike." Dobroyd Head is the location of one of those sandy, secluded beaches, surrounded by a headland of dramatic cliff-faces. It is possible to catch a leisurely bus ride from Central Station to Dobroyd Scenic Drive and Arabanoo Track. On an average weekday, it takes just under an hour and ten minutes to travel to Dobroyd Scenic Drive by bus and train. The most time efficient way to get to the furthest reaches of Manly from Sydney's CBD is undoubtedly by driving. Due largely to the speedy highways and freeways that line Sydney's Northern Beaches, the strip should take under half and hour in normal traffic. Apart from taking a quiet dip at Dobroyd Head Beach, there are various opportunities for the bushwalking enthusiast. The track around Dobroyd Head runs for over 1.5 kilometers, and in 2009, there were substantial bush track upgrades through the National Park at Dobroyd Head. The Council has added signage for anyone interested in leaving the beach and setting off on a brisk walk.